Gordon’s String Music, Tallahassee’s “Home of Traditional Music”, offers folk music lessons in harmonica, Bluegrass vocals, guitar, violin, viola, string bass, banjo, dulcimer, mandolin, dobro, and ukulele. We will teach students to play by ear or to read music – “by rote or by note”. We operate Tallahassee’s first School of Traditional Music. 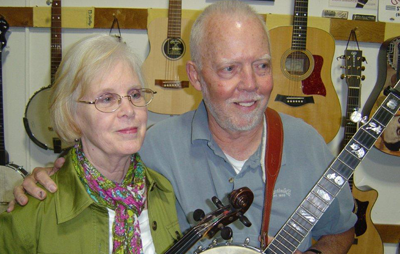 Our teachers, Gordon and Jane Scott, have a wealth of performance experience in varied styles including Bluegrass, Irish, old-time, country, rockabilly, folk, blues, and gospel styles. Gordon teaches on Monday, Tuesday, and Wednesday from 12 noon until 7 PM in the evening offering lessons on guitar, string bass, banjo (5-string Bluegrass and clawhammer styles), tenor banjo, mandolin (octave, tenor as well), harmonica, ukulele, dobro and dulcimer. He teaches lessons in Americana styles such as Bluegrass, folk styles, Irish, blues, old-time, country, and basic rock. Jane teaches on Tuesday and Wednesday from 12 noon until 7 PM offering lessons in fiddle (Bluegrass, Irish, old-time tunes), basic guitar, basic mandolin, beginning viola, beginning piano, penny whistle, recorder, and ukulele. Lessons are $100 per month for four thirty minute private lessons. To schedule a lesson, call the store at (850) 386-7784 and talk with Gordon, Jane, or Drew during business hours - Mon. through Fri. 10:30 am 'til 6 pm. Email is at the bottom of the page.